Regret is an appalling waste of energy; you can’t build on it; it is only good for wallowing in. Glory to God, we can get up every time we fall and by the power of the Holy Spirit go to our Father in prayer, saying as did the Prodigal, “I am not worthy to be treated as your son.” And we can expect to be embraced, and to be built up in Christ. 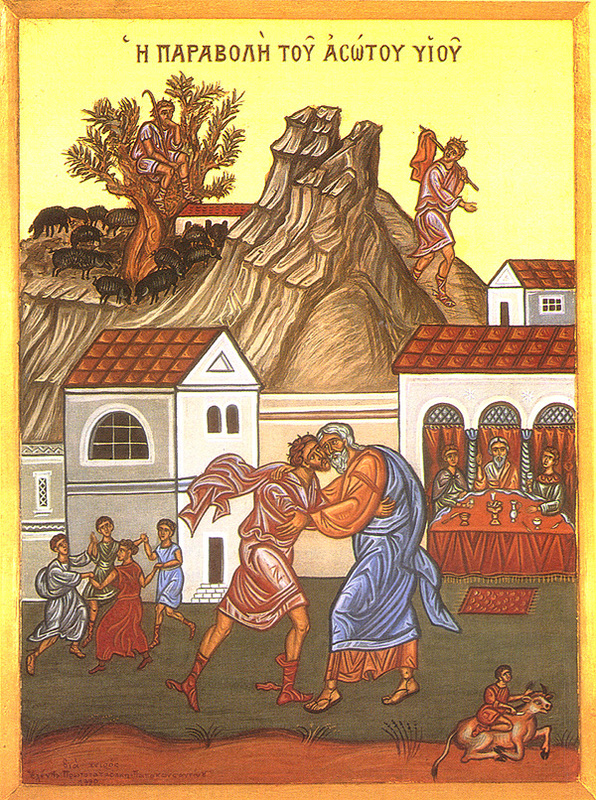 Addendum: By the Linked-Within feature I discovered that I did in fact write about the Sunday of the Prodigal Son before, and even used the same icon. It’s sort of a sequel to this part, discussing what happened after he left the pigsty. I like this quote and your message, which is perfect for Lent. A friend said to me recently that we shouldn't regret what we have done, only what we haven't done. I'm still mulling that one over! I like the contrast between building and wallowing too. If we stay in regret we really cannot change.